Scented candles in a Tin packing.Comes with a Coke-can type metal seal, which preserves the fragrance till it is opened. 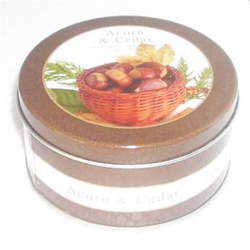 Since the tin box can be sealed with the plastic cover when not in use, the fragrance lasts for much longer. Ideal for traveling, as can be safely stored and reused.